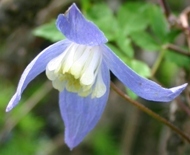 I’ve been walking and hiking in the Dolomites for over 20 years, so when I heard that Christopher Buckley was planning to join our Wildflowers in the Dolomites tour, I was confident that I could show him a good time. That was before we met our alpine guide, Piero. 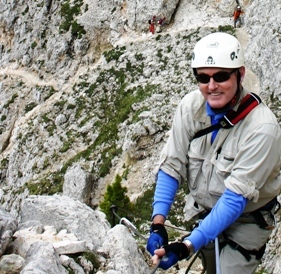 Christopher Buckley was assigned to write an article about Italian Connection’s Dolomites tour for ForbesLife, and the magazine was intrigued with the idea of including a hike on a via ferrata, an extra option on our Dolomite walking tours. Christopher was also intrigued, until the actual day arrived, when intrigue turned into total exhaustion. A via ferrata, or iron way, is a mountain route originally constructed during the First World War to move troops through rugged terrain, and is essentially a footpath that uses fixed iron cables for protection on narrow exposed trails. 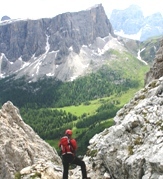 Today, with a minimum of equipment a hiker on a via ferrata can reach spectacular places normally restricted to expert climbers. 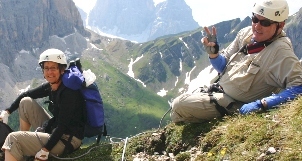 There are several levels of difficulty for a via ferrata, and sometimes a route may include iron ladders, steep vertical sections, or narrow bridges over gaps in the mountains – not advisable for the vertigo-prone. Equipment includes a helmet, harness, and short ropes with karabiners, used for clipping onto the fixed cables. A qualified alpine guide is recommended for the novice, which is why I hired Piero for the day. In my experience, the thing that all alpine guides have in common is that nothing is hard for them. After all, they have done years of climbing in icy conditions in order to become licensed, so an easy level via ferrata on a summer’s day is hardly a challenge. Alpine guides have an uncontrollable urge to go vertically up, up, up to the highest point on the horizon, preferably along the steepest route. But other people are not like this, a concept that alpine guides apparently do not grasp. They are too busy tying elaborate knots and looking enthusiastically upwards to notice the average person’s utter terror. The Ra Gusela via ferrata that I chose was rated an easy level and I’d done it several years ago, plus the route included the possibility of adding on a second short via ferrata if we had the energy (we did not.) The route involved some hiking in spectacular scenery, and it had a number of access points via chairlifts, as well as a mountain hut rifugio serving great food. So it all seemed like the perfectly planned day. We met our alpine guide Piero at Passo Giau, and he soon had us decked out in helmets and harnesses, and we set off down the trail for the walk to the turn-off for the via ferrata. But before we got there, Piero’s urge to go upwards kicked in, and somehow he managed to convince us to follow him as he veered off the trail onto a “shortcut,” which soon turned into a vertical scramble on narrow footholds with the mountain literally in our face. Piero was annoyingly chirpy as he scampered up the mountainside while I tried – not always successfully – to dodge the rocks that a panting Christopher was dislodging above me. After that day, which Christopher cheerfully dubbed “Death Mountain”, we confined our walks to meadows cloaked in wildflowers and enjoyed our luxury hotel with drinks in the bar. After all, you only live once. Details: The via ferrata is an extra option on all our Dolomites tours. 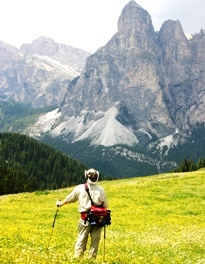 Christopher Buckley’s article about Italian Connection’s Wildflowers in the Dolomites tour is to be published in the March 2010 issue of ForbesLife. I have to agree with Christopher…this tour is stunning and the end of the day brings you to wonderful hotels, wines, food and conversations. We did this sold out trip in July 07 and will do it again along with the extended version you can add on. Great job Anita!